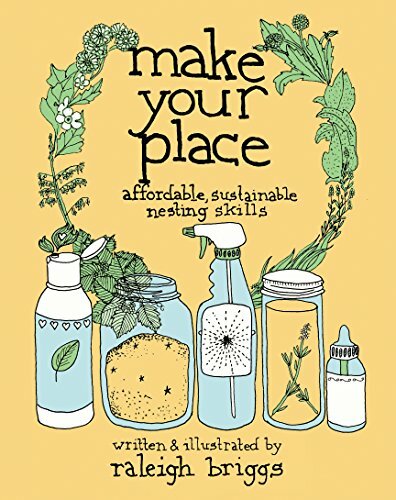 “Make Your Place: Affordable, Sustainable Nesting Skills” is a Do-It-Yourself home remedy guide filled with recipes for natural first aid and body care treatments along with techniques for growing your own plants. According to its author, Raleigh Briggs, the intention of the book is to encourage the use of pure, homemade medicinal, cleaning and food products as opposed to the chemical or more expensive organic versions offered by commercial markets. It is the author’s belief that using herbs and other organic ingredients is gentler on a person’s system because the components can be modified and the results are slower acting with fewer side effects. In addition, the formulas are toxin free and made using essential oils, herbs, plants, vinegar and other wholesome ingredients. What makes this reference guide so unique is its homemade quality. The book’s hardcover has a welcoming hand drawn design that follows the format of its overall style - friendly and relaxed. Even the writing is hand forged and accompanied by delightfully detailed sketches and diagrams illustrated by the author. The language is also quite colloquial but suits the publication’s casual tone. The only caveat of the book, and the author suggests this, is that you need a supplemental text or lesson on foraging if you are going to source your own plants, roots or herbs. However, the dried versions of these ingredients can easily be purchased. In addition, Briggs’ chapter on gardening provides a cost effective way of establishing your own stock of essentials. Briggs’ content is well organized into subchapters and covers a lot of territory for its small size. Just about any type of ailment or general health category is addressed with several alternatives suggested for each. Many holistic books only give you a short description with a strict list of ingredients. It is enlightening to get extra details for specific hair and skin types, a range of cold symptoms and assorted varieties of floor cleaners. Included with each remedy/recipe is a comprehensive list of tools and equipment needed, tips for application as well as things to avoid. Her chapter on gardening is my favorite - a guide all onto itself with simple step-by-step instructions that will entice you to get outside and start planting and growing your own vegetables today. Any crafty person will be attracted to Raleigh Briggs’ DIY manual of herbal remedies, recipes and techniques. “Make Your Place: Affordable, Sustainable Nesting Skills” is a terrific guide for creating a healthier existence. Brigg’s personality shines in this publication and her authenticity is as unmistakable as her hand-printed text. She gives us simple, cost-effective alternatives to what we put into and onto our bodies that is appealing and forthright. I recommend her book wholeheartedly to anyone interested in becoming more self-sufficient in a simple and wholesome way.